Who are these happy bunch of girls ?? On the Delhi – Mathura High road lies Ballabgarh – a small town in Faridabad district of Haryana. It has a Railway station too…. Jat Raja Nahar Singh (1823–1858) was the last king of the princely state; he was executed for taking part in the 1857 War of Independence. The state was founded by Balram Singh, in 1739, who also built the Nahar Singh Mahal palace in the same year. Imagine a player from here representing India and coming out successful too. Mohit Mahipal Sharma was known to outside World when he played for CSK in the last edition of IPL; he debuted in the 4th ODI against Zimbabwe, took 2 wickets picked up the Man of the Match award – equalling the feat of Sandeeep Patil way back in 1980 against Australia [MoM in debut match]. Success stories from smalltime towns are rare – Sourabh Tiwary came closer but have not made a mark yet – outstanding is MS Dhoni that way. In Dhoni’s Ranchi – Ormanjhi is a much smaller town, known for its picnic spots- a few girls who have not earlier ventured outside have done the Nation proud. We call India cricket crazy…. For England and Australia is of national importance. There have been many many wrong decisions – Sachin has received some horrendous decisions – there is one rule – Umpire’s decision is final and ‘batsman have to start their walk towards the pavilion once the Umpire’s finger goes up’. Virat Kohli was criticized when he disputed the catch after he was given out ……. but …. When Usman Khawaja was given out ~ another wrong decision ~ the Australians are furious and it is not simply the critics – Australian PM Rudd tweeted almost immediately- “That was one of the worst cricket umpiring decisions I have ever seen.” All those who were making scathing remarks on India’s non-acceptance of DRS are now questioning the same DRS. Cricket Australia is now asking the International Cricket Council to explain why third umpire Kumar Dharmasena upheld an on-field call at Old Trafford, despite replay technology indicating that Khawaja’s bat made no contact with the ball the ‘edge’ being the essential ingredient for a caught-behind decision. In this melee, not many would have noticed something about Gaztiez Cup 2013 – the XVIII Edition of the International Youth Soccer Tournament where 4 continents with teams in Europe, Asia, America and Africa teams from as far away as Mexico, Uganda, India and France participated. Two weeks ago a group of teenage girls from a village on the outskirts of Ranchi in Jharkhand achieved something that sportspersons with the best facilities and support in cities often aspire for but don’t always succeed. On July 13, the 18 tribal girls representing Yuwa India under-14 all-girls team were placed third among 10 teams playing for the Gasteiz Cup in Victoria Gasteiz in Spain. The girls — a majority of whom played outside their village in Ormanjhi for the first time — were placed third after two wins, two losses, and one draw against international teams. Earlier during the Donosti Cup, Spain’s biggest football tournament, the girls made it to quarter finals from among 36 international teams. 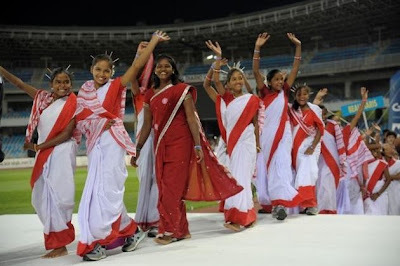 The young footballers wearing red and white sarees and sneakers, with plastic flowers adorning their hair and around their wrists, were ecstatic as they won the third prize in Gasteiz, Spain that Saturday night. “We had carried sarna sarees in our bags and some flowers too. When they announced our names we ran into the dressing room and took just five minutes to get dressed in our sarees, then we came out and accepted the prize and then we danced,” grinned Rinky Kumari, 13, the team’s captain back in Ormanjhi. “Yuwa yuwa hum hai yuwa, sab se juda; gendwa ko maarei, netwa ko phaade, mil ke bolo Jai Yuwa (We are young, so special; we are on the ball, we attack the net; all hail Yuwa),” the team breaks into chorus before practice on Thursday afternoon. “They were cheered everywhere they went. They would break into song and dance always even doing the jhumar (traditional dance) with a team from Spain at San Sebastian. The only time I saw them nervous was the first game,” recounted Sandeep Chhetri Yuwa’s secretary and the team unofficial cheering songs writer. Shivani Toppo, 12, who has played football since Franz Gastler, a 30-year old American founded Yuwa-India in this Jharkhand village in 2009 and was among two girls from Yuwa who had toured with India’s under-14 team in Sri Lanka last year, explains her interest in the game. “It keeps me healthy. If I stay home I do not feel good. Also, Franz sir got all of us to go to good schools. He helped my family pay the school fee and now the school has waived the fee off,” says the team’s second defender. Shivani’s family lives in a kutcha house in Hutup not far from the football field. On her way home after the two hour practice session everyday neighbours would pass rude remarks, Shivani recalls.